in the House and Senate, would add victims of domestic violence to those eligible to receive benefits under the current unemployment law. Victims would receive com-pensation for a period up to 12 weeks. Victims would need to prove that they voluntarily left their job as a direct re-sult of domestic violence. It would also require victims to demonstrate that a reasonable effort was made to maintain their employment, such as requesting to be transferred to another location. 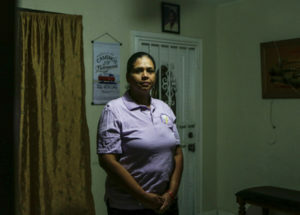 Miami-area victims are increasingly finding them-selves hostage in abusive relationships due to low wages and rising rents, said Jasmen Rodgers, who works at the center. Tethered by her inability to work, Gomez said her abusive relationship caused her to lose everything. Physicians diagnosed her with post-trau-matic stress disorder, and her children were placed in foster care by the state.